Enjoy your time at port with other "Intuition Cruise" participants. These Shore Excursions will be accompanied by our most popular speakers. There will be an extra fee for these awesome events. We will dock at three ports: George Town in Grand Cayman, Coxumel in Mexico, and Puerto Costa Maya in Mexico. There Divine Travels is offering specific shore excursions for our "Intuition Cruise" group. By booking one of these shore excursions, you can enjoy touring with like-minded individuals who are taking the Seminar-at-Sea. 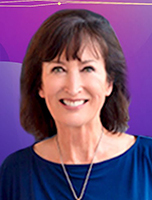 Special Events and Shore Excursion tickets will be handed out to you during the "Intuition Cruise" registration in the Conference Center, Deck 2 Forward, right after you board the ship. Please look over your excursion tickets carefully, verifying meeting time and location. If you are traveling in a group, ensure that everyone has the same meeting time. Please also take note of the "notes" section of the ticket; this will indicate special information that you need to know about the tour. "Dolphin Swim and Stingray City"
Enjoy a thrilling experience at Grand Cayman's #1 attraction, Stingray City, and its highly awarded Dolphin program. 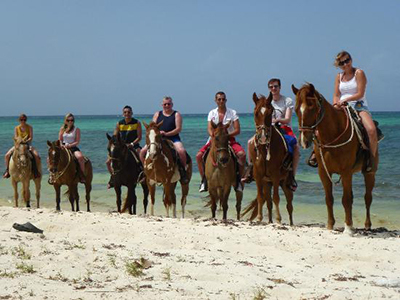 Your tour begins on a nature trail viewing authentic Cayman vegetation and mingling with exotic birds. A brief orientation occurs before coming face to face with playful dolphins in the waist-deep waters of the Caribbean Sea. 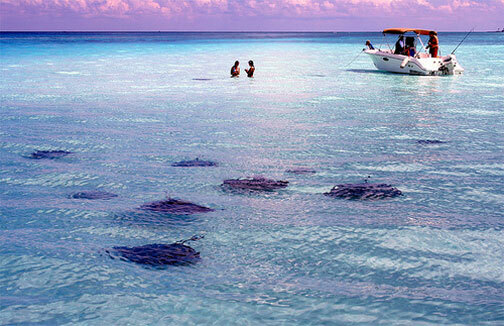 Your relaxing boat ride takes you to the world-famous Sting Ray City Sandbar where you'll interact with wild stingrays. 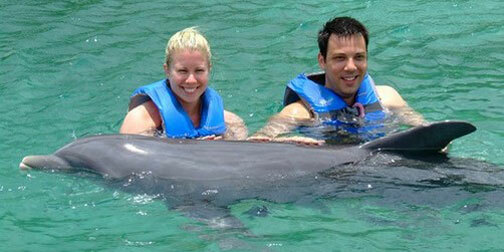 - Dolphin Program: Kiss, touch and pet the dolphins in the waist-deep waters of the Caribbean Sea. - Sting Ray City: Interact with wild stingrays. - Recommended for strong swimmers 8 years of age and over. - All children 8 years of age and under must be accompanied by a paying adult. If swimming with dolphins is one of your greatest dreams, now is the time to make it real! In the crystal clear waters of the Caribbean Sea you will be able to live an adventure that you will remember forever. 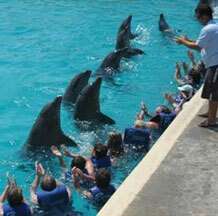 From the pier, you'll take a short drive in air-conditioned comfort to Dolphin Cove. Here you'll stroll along a walkway where you'll see a variety of tropical birds that rule the roost. Once you reach the cove, there'll be a brief orientation about these enchanting dolphins. Then in the water you go. Pet and kiss a dolphin. Shake a fin. Hear them sing to you and perform tricks. But for real fun, hang on for a belly ride. A dolphin is half submerged on its back and you grab on to his flippers for an awesome belly ride through the water. You'll be amazed by the strength, flexibility and agility of these mammals. After your dolphin encounter, you'll board a boat and cruise to Grand Cayman Island's famous Stingray City, a 12-foot dive site with an adjacent sand bar. 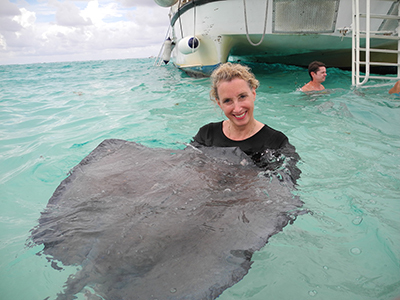 Your tour guide will provide interesting facts about the local family of Southern Stingrays when you enter the shallow water on the sandbar. 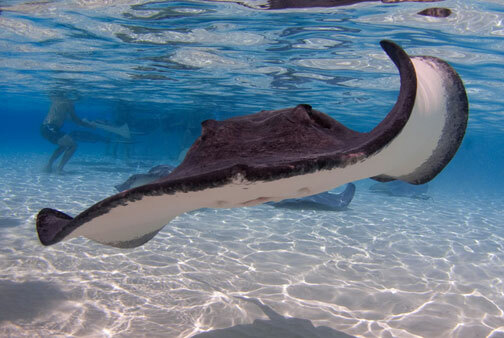 In just three feet of water, you can interact with more than a dozen stingrays as they glide by you. These gentle creatures will allow you to handle them. They like to be fed and have their bellies rubbed. You'll be amazed when you touch them. Their scales feel a lot like velvet. Upon leaving Stingray City, you'll enjoy the return cruise back to Dolphin Cove where you can relax before boarding a motor coach to George Town. There will be time for shopping at the many duty-free stores within walking distance from the cruise terminal. You'll find bargains on such luxury goods as watches, china, crystal, perfume and fine jewelry. Instead of shopping, you have the option of being taken to world-famous Seven Mile Beach where you can enjoy the wide stretch of white sand beach, tropical breezes and swimming and snorkeling in the clear Caribbean Sea. So for two amazing experiences in Grand Cayman Island that you'll never forget, book the Dolphin Swim & Stingray City shore excursion now. 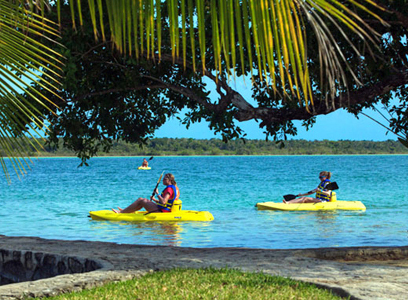 It's an unforgettable way to add fun ashore to your fun afloat. Accompanied by John Holland or Denise Linn. 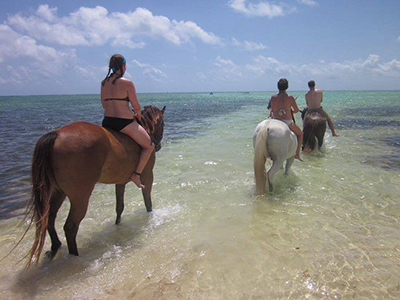 Rate includes admission to the beach with round trip transfers, horseback rental, and guide. It does not include meals, beverages or gratuities. Long pants, sensible closed-toe shoes, hat, cool and comfortable clothing, swimming attire, towel. Weight: up to 225 lbs; Age: from 7 yrs; Medical condition restrictions: Back, heart, inability to walk, climb, pregnancy. 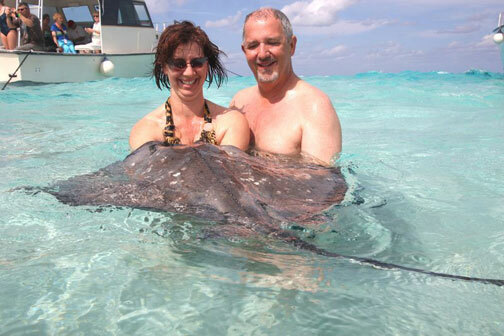 The Ride 'n' Swim Grand Cayman shore excursion is a must if you are looking for an experience out of the ordinary. And aren't you? 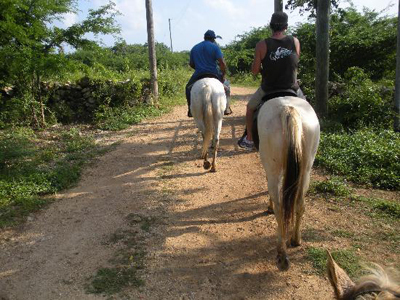 Your adventure begins when you are picked up at the pier and shuttled to the north shore of the island, where your horse awaits. The transfer takes approximately 30 minutes. Along the way, you will have glimpses of the world-famous beaches and receive a brief history of this gorgeous island. You will arrive in West Bay, at the tip of the island, and home to stunning beaches and magnificent ocean views. After a brief introduction and instruction, mount your horse and enjoy the peacefulness of nature at its most relaxing, with just your private party and your guide. 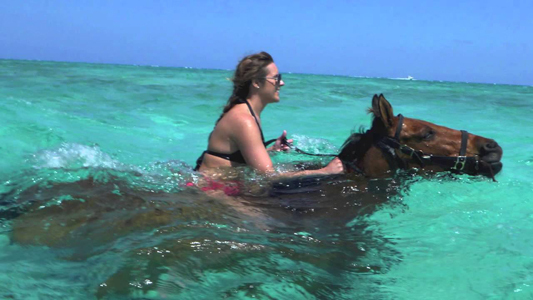 Your ride lasts approximately 90 minutes, and you will be able to relax as your horse lazily treks across the beach, letting you take in the awesome Caribbean Sea and lush scenery. The exquisite natural backdrop atop your horse makes for a great photo op, so be sure and have your photo taken as a souvenir of one incredible adventure. 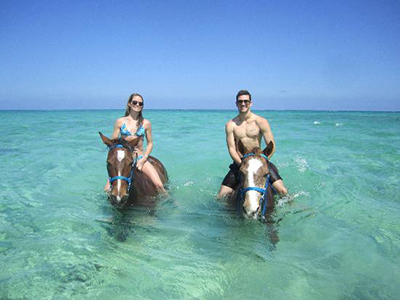 End your tour with a refreshing dip in the Caribbean Sea... on horseback! 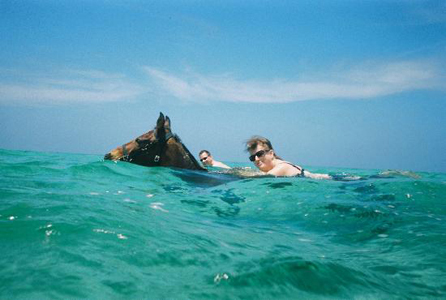 This ride has the added bonus of swimming with the horses in the Caribbean Sea. 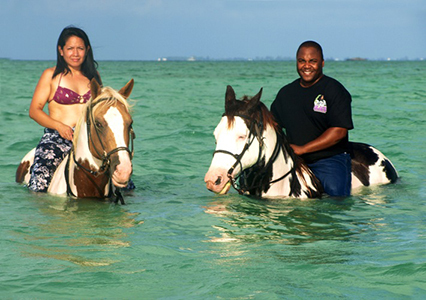 Riders who prefer to stay dry will dismount their horses and wait on the beach until the conclusion of the swim, which lasts approximately 15 minutes. After this brief rest, you will be returned to your starting point, where you can tell everyone about your awesome experience. 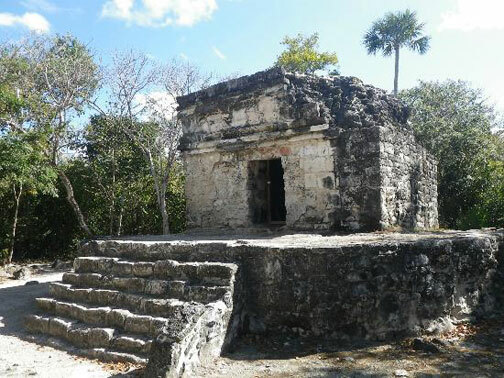 The fee includes all entrance fees to the San Gervasio Ruins, El Mirador, Punta Sur, and the visit to the Mayan House at El Cedral, which includes also a local small snack prepared on site by a Mayan lady. Transportation will be 45-passenger motor coach. Medical condition restrictions: Back, heart, inability to walk, climb, pregnancy. 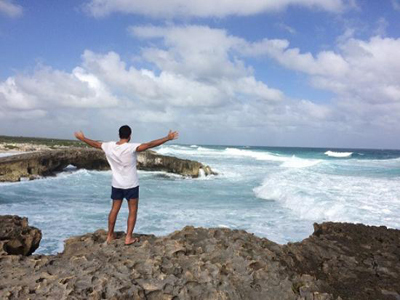 Embark on a pilgrimage to ancient Maya ruins in Cozumel. Explore Cozumel's illustrious native Maya civilizations as we scour historic archeological ruins and delight in the island's breathtaking oceanfront scenery along pristine white-sand beaches. Enjoy a dynamic motor coach ride, admiring spectacular crystal-clear Caribbean oceanfront vistas. 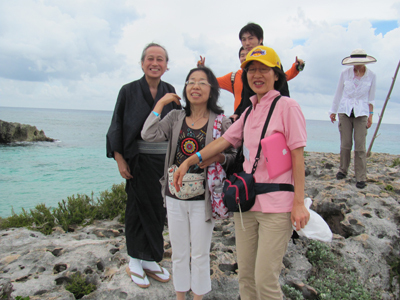 We will meet at the gathering place printed on your shore excursion ticket and then board our coach at the port in Cozumel. We will then travel for about half an hour to the sacred site of San Gervasio, the only site in the entire ancient Maya world dedicated to the Goddess. 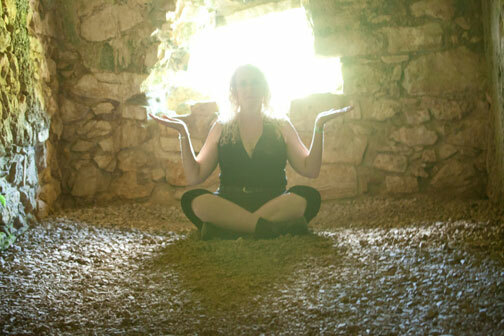 There we will tour the sacred sanctuary to the Goddess and experience her gentle vibration of peace, love, and harmony. 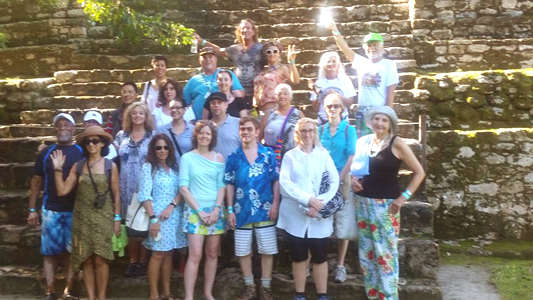 At San Gervasio, in the home of the Goddess Ixchel, led by a knowledgeable guide, we will visit the ruins of the sacred temple where the Maya people gathered to worship goddess Ixchel. 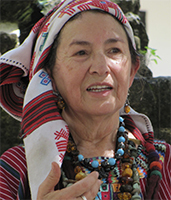 We will also receive wisdom and teachings from one of the most respected and honored Maya elders in the world: Grandmother Elizabeth Araujo, of the Council of Mayan Elders in Guatemala. 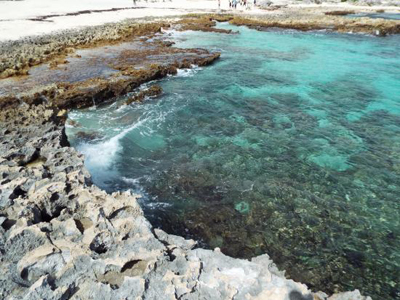 After our visit to San Gervasio, we will board our coach and travel to El Mirador (The Looking Glass), a beautiful natural bridge over the ocean carved out of a coral reef. Then on to Punta Sur for a view of the Maya ruins of Caracol. 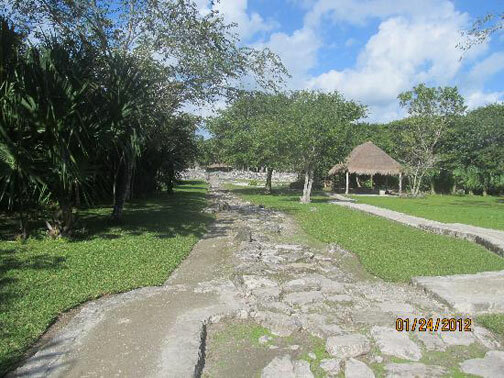 Finally, we will drive to El Cedral, the oldest Maya site in Cozumel, where we will enjoy a snack prepared by a Maya lady. 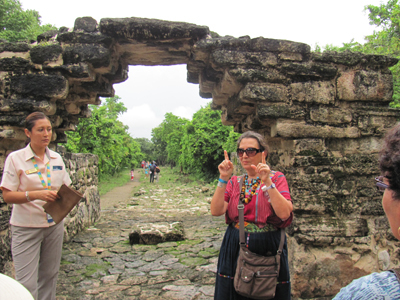 - Maya Ruins: Tour the Ruins of San Gervasio led by a guide, viewing the worship space dedicated to goddess Ixchel. - Scenic Drive: Relish panoramic oceanfront views of turquoise Caribbean waters and alluring white-sand beaches while traveling via motor coach. 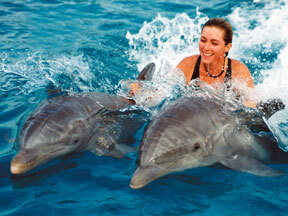 - Consider physical fitness and medical history when selecting this tour with swimming elements. - Guests must be able to walk over uneven surfaces. - Avoid alcohol before water activities. - Guests taking video in any format (video camera, cell pone, Tablet etc.) 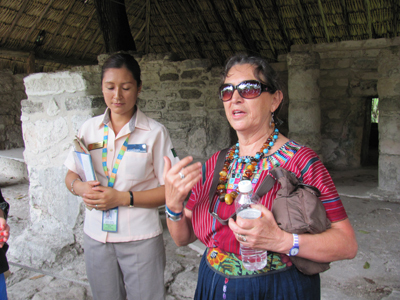 within the Archaeological Site will be charged government fee of approximately $8-$10 USD payable in cash at site. Most important Maya ruins in Cozumel, this place was the Maya sanctuary of Ixchel, goddess of love and fertility, an obligatory visit site for mayas once in their lifetime. 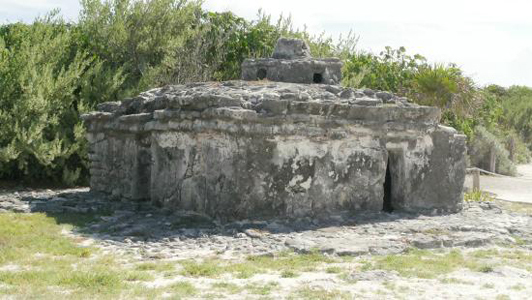 The Maya sites of Tulum and Coba are also accessible from the port of Cozumel. 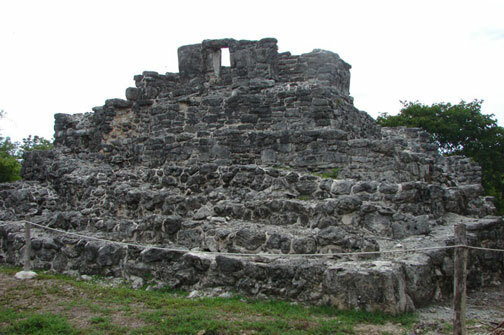 However, in terms of importance in the Maya culture, Cozumel's San Gervasio ruins are a more significant site than Tulum. 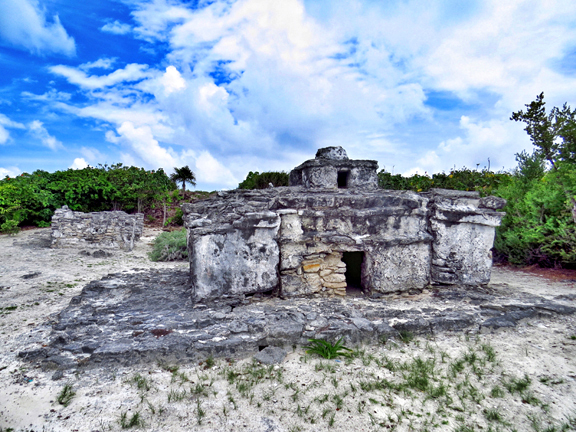 Tulum was simply a coastal "watchpost," whereas San Gervasio is the home of the temple built to honor the Goddess Ixchel. 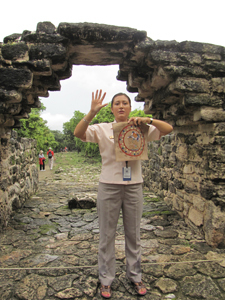 Here you will experience firsthand the mysteries of Maya culture at the largest archeological site on the island. 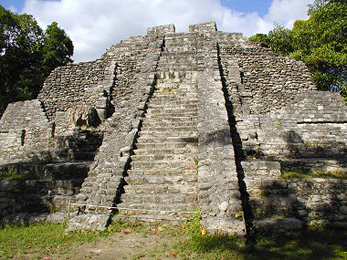 The Maya archeological site of San Gervasio has an unusually long history, beginning around 100 BC. 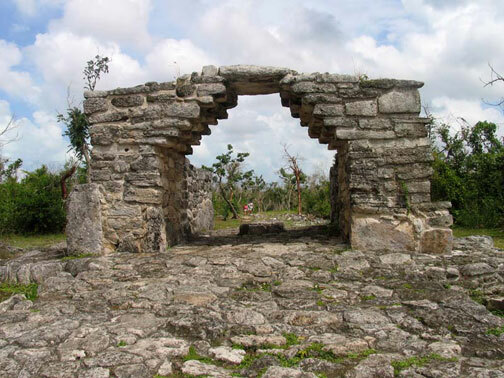 Located on Cozumel Island, the largest island in the Mexican Caribbean, it was still a functioning religious site at the time the Spaniards arrived in the 16th century. In the heart of the island, in a lush jungle populated with brilliantly colored iguanas and lush flowers and foliage, one can see why no one ever wanted to abandon this beautiful place. 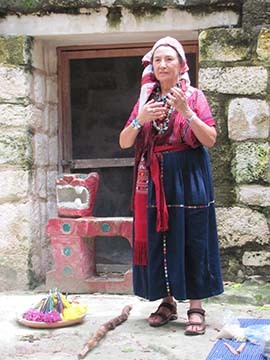 In ancient times, every Maya woman was expected, at least once in her lifetime, to make the journey to Cozumel from the mainland to make offerings to Ixchel for her family's fertility and crop sustenance. 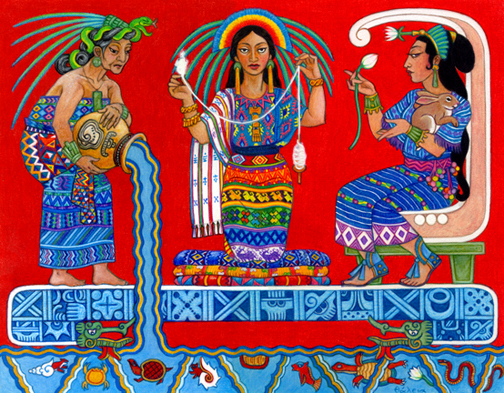 Ixchel ("She of the Rainbows") is the deity of midwifery, fertility, medicine, weaving, and rain. Ix Chel,Ix, meaning female, and Ch'el, meaning white or pale face,is a name befitting a moon goddess. She is also identified in the Madrid Codex as "the White Lady." The bishop of Yucatan, Diego de Landa, wrote in 1549 that the Maya "held Cozumel in the same veneration as we have for pilgrimages to Jerusalem and Rome, and so they used to go to visit and offer presents there, as we do to holy places; and if they did not go themselves, they always sent their offerings." 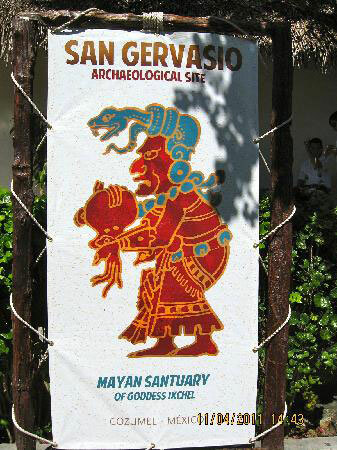 San Gervasio was the sanctuary of the Goddess Ixchel as well as an important commercial, political and cultural center. Engravings at the site relate to events all over the Maya world. A graceful arch protects an altar on a sacbe (ancient road) leading into the ceremonial center. 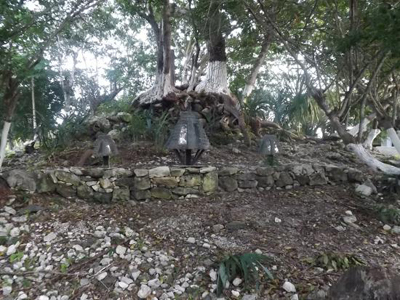 Many statues to Ixchel were found here and are still being discovered at the 40+ temples on the island. It is believed that a large ceramic image of Ixchel delivered oracles spoken by a hidden priestess for pilgrims with questions. Although the archaeological site at San Gervasio has not had a lot of restoration, there are numerous structures and the beautiful natural setting makes a visit there worthwhile. One of the most interesting buildings is the Temple of the Hands. Inside, numerous small red hand prints of unknown significance are painted on the wall, leading more than one tourist to speculate that perhaps this was a day-care center for pilgrim moms! 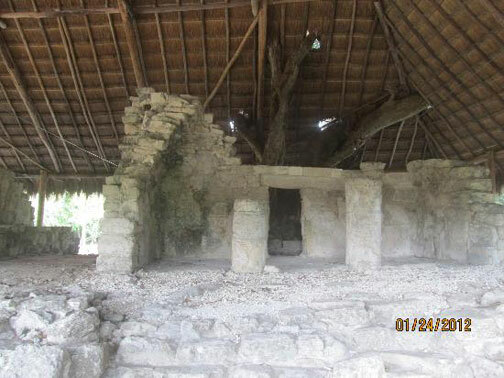 The Maya ruins at San Gervasio are a welcome retreat for those visiting the busy island of Cozumel. 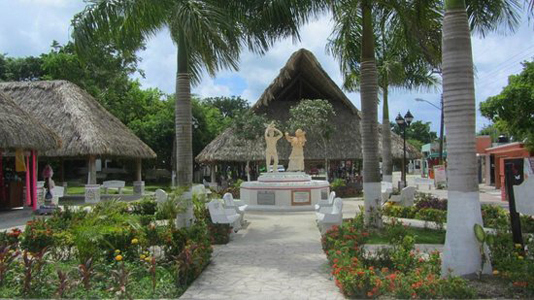 Enjoy the peaceful setting of this fertile jungle shrine dedicated to the Maya goddess Ixchel. 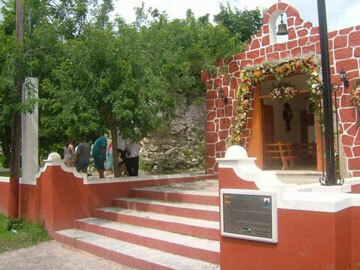 El Mirador is a naturally formed Cozumel landmark. 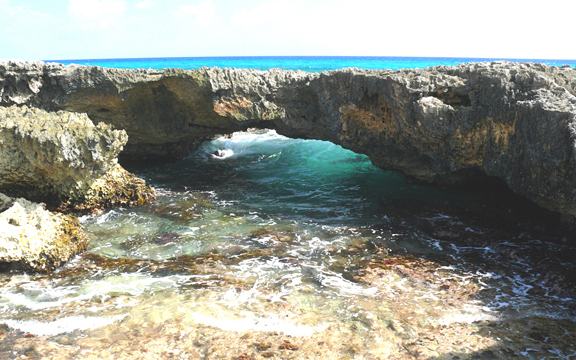 Over thousands of years the coral rock that composes the caribbean sea bed has been pounded by waves that erroded the coral reef into this magnificent natural bridge. Every year countless visitors climb on top of this natural wonder as they watch the sea roll in. Most tourist who visit this beautiful site are unaware of its history. And most who live here were not old enough to know. Before Hurricane Gilbert in 1988 there was a formation known as the "Champagne Cup." It stood majestically right in the middle between the natural bridge to the south and the large rock outcropping to the north. The Champagne Cup had one very unique feature. It was not only shaped like a Champagne cup, but the top was made out of the same porous coral rock as the natural bridge and coral rock that encircles the island. Whenever a large wave would come in, it would break all around the formation and splash on top with a lound "woosh." And as the water splashed down on top of the Champagne cup, hundreds of thousands of bubbles would erupt on top!!! Just as you would expect a cup of Champagne to act! It was absolutely breathtaking. And on a full moon, it was the most romantic place to be on the island, where you could enjoy a toast sitting on a beach blanket, on a full moon! 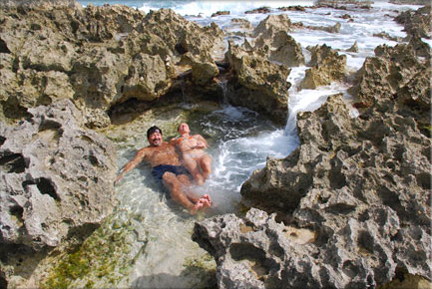 Another unique feature that most people do not know about is the natural Jacuzzi! This feature is approximately 70 yards to the south of El Mirador. Each time a set of waves comes in, the water bubbles up from the bottom of the "Jacuzzi." And when you are sitting in it! Well, use your imagination. If this doesn't make you feel special; nothing will! 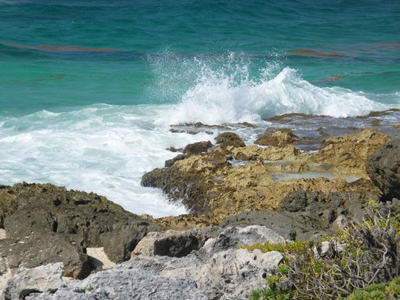 Cozumel's Punta Sur Eco Beach Park is one of the island's true natural treasures. Encompassing 247 acres, this ecological reserve and park contains an extraordinary diversity of natural landscapes, including numerous beach areas, a lagoon, low forest areas and coral reefs just off shore. 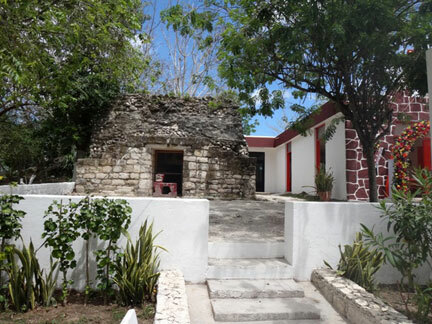 In addition to these natural attractions, Punta Sur Park is also home to a Mayan Ruin site as well as the Celerain Lighthouse and a navigation museum. 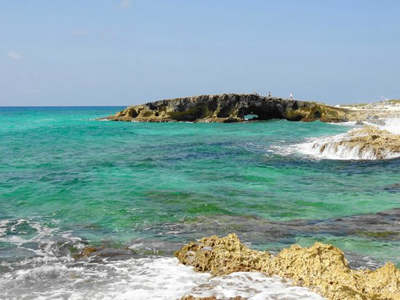 The Parque Punta Sur Ecological Reserve, located at kilometer 27 of the south of the island of Cozumel . This is the materialization of an ecotourism project of the Foundation of Parks and Museums of Cozumel that promotes the rational management of natural resources available to the Refugio State Flora and Fauna of the region known as Laguna de Colombia in which it is located. 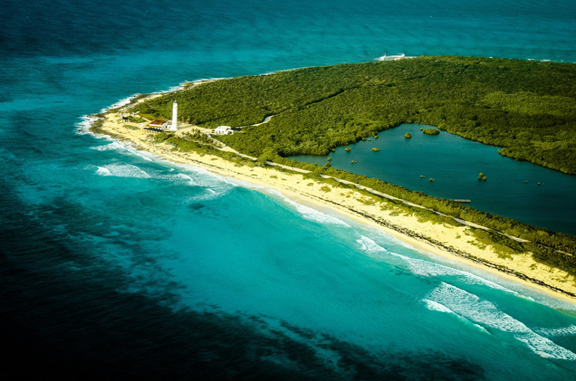 The Parque Punta Sur Ecological Reserve contains a remarkable variety of natural beauty, extent of one thousand hectares and is dominated lagoon with its characteristic physiognomy of coastal wetlands and mangrove forests are a mosaic of environments and ecosystems that support a wide richness and diversity in wild Fauna and Flora. The west coast area of the park has a designated snorkel area with an abundance of fish close to the shore. The beaches on the east "windward" coast of the park are equally beautiful interspersed with rock formations and high sand dunes near the lighthouse. Beaches on the east serve as a sea turtle nesting zone from May to October. Colombia Lagoon is one of the main attractions with its mangrove swamps and jungles that shelter a variety of wild birds, reptiles (crocodiles), fish and vegetation. 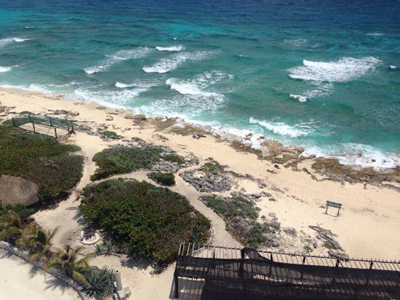 In the summer months, this Park area offers information and viewing opportunities of Cozumel's nesting turtles: the loggerheads and green turtles. It is easy to observe nature in this park area by viewing flora and fauna from the decks, towers and boat landings located throughout the park. There is also a rich history and cultural perspective you can experience in the park. A Mayan ruin El Caracol, in the shape of a shell, was probably used as a lighthouse in earlier times. It is a unique structure with conch shells imbedded in the walls that whistle in different tones depending on the direction of the wind. In the Punta Celerain Lighthouse you can learn the history of navigation around the island. In the colonial period, this area was a refuge for pirates and smugglers. During the first half of this century, the livelihood of the residents near the lagoon depended on agriculture, fishing and crocodile hunting. Punta Sur has something for everyone--nature lovers, history buffs, sun worshippers as well as those who yearn to spend the day relaxing in a quiet spectacular environmental setting. 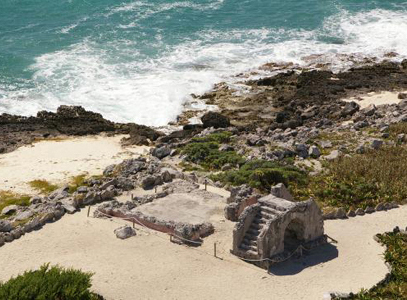 Once the hub of Maya life on Cozumel, this was the first site found by Spanish explorers in 1518, and the first mass in Mexico was reportedly celebrated here. These days, there's little evidence of its past glory. It is believed to be hundreds of years old and faint traces of the original paint and stucco are evident. 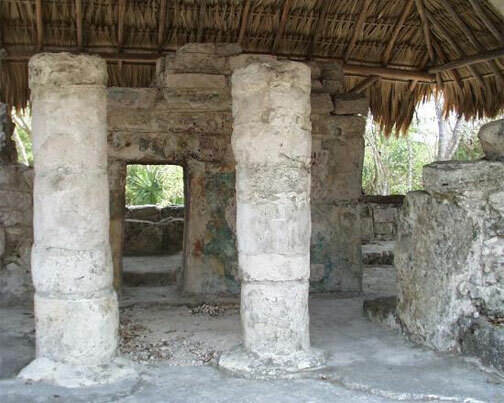 El Cedral is different in shape from the typically small and low structures found on the island, suggesting it was used for major ceremonies. Nearby is a green and white cinderblock church, decorated inside with crosses shrouded in embroidered lace. 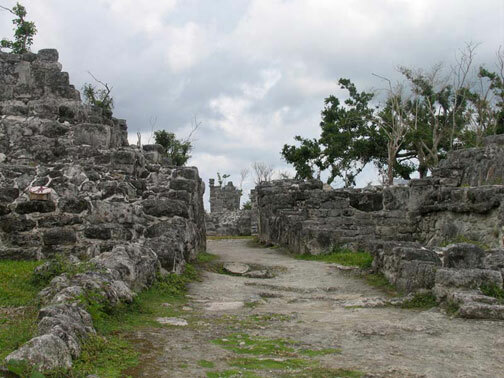 El Cedral is the oldest Maya Ruins on Cozumel Island, dating back to 800 A.D. 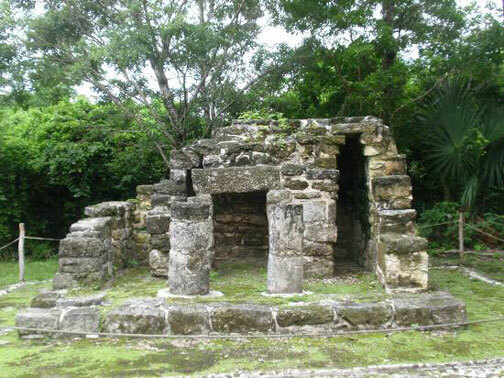 The Maya village was once the capital of Cozumel, and the largest community on the island. It was discovered by Spanish Conquistadors in 1518, who tore down much of the Maya temple, and then during World War II, the U.S. Army Corps of Engineers destroyed more of it to make way for the island's first airport. 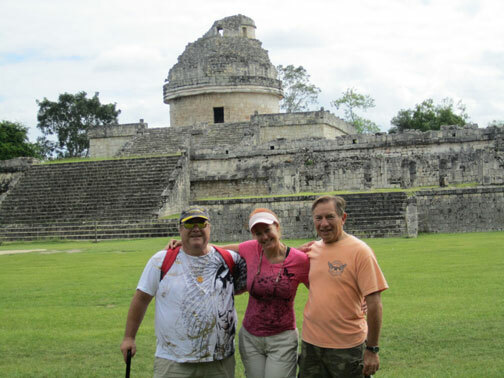 Today, there is not much of this once significant Mayan temple remaining, but you can see a portion of it, and with the help of one of our knowledgeable guides, you can picture the community as it once existed - as the hub of Maya life in Cozumel. During the 1800's, El Cedral was used as a jail. Today, the area is occupied by a small farm settlement. Every May there is a fair held at this location called Festival de Cedral, with several days and nights filled with traditional ceremonies, dancing, music, bullfights and a cattle show. 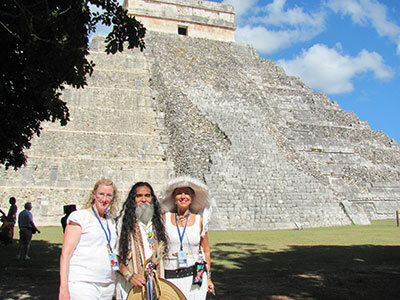 "Chichen Itza Sacred Maya Pyramid"
Accompanied by Judy Satori and Debra Silverman. 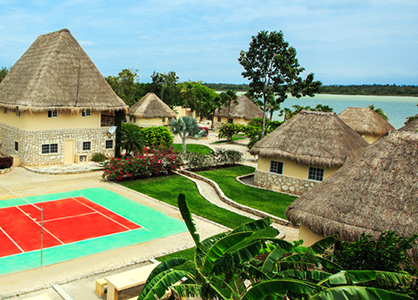 Rate includes a meal, beverage, admission to the archaeological site with round trip transfers. and guide. It does not include gratuities. Age: from 7 yrs; Medical condition restrictions: Back, heart, inability to walk, climb, pregnancy. 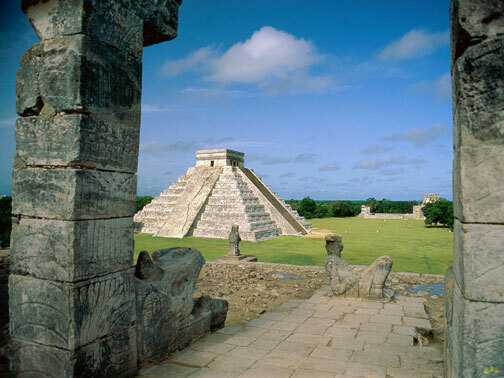 One of the Wonders of the World and home of the great Mayan empire, the Chichen Itza, extends 6 square miles with several hundred magnificent buildings. You'll enjoy exploring this legendary city for 1.5 hours strolling by the great pyramid of Kulkulcan, the largest and best-preserved Mayan ballpark, the temple of Venus, the temple of Warriors, and tzompantli among others. 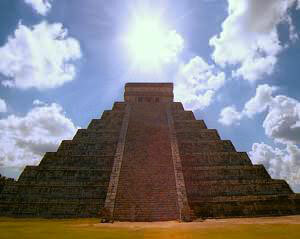 - Chichen Itza: Visit the most impressive Mayan site on the Yucatan peninsula. - Lunch and Refreshments: Enjoy included box lunch and soft drinks. - Tour is 8 hours and takes 6 hours total travel time, including the ferry. 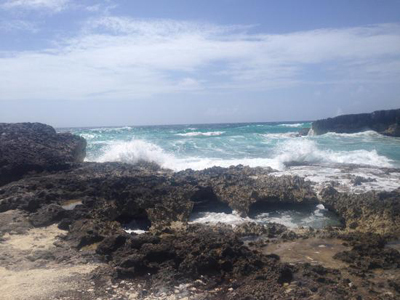 - The ferry ride to and from Playa del Carmen takes about 45 minutes each way. - Guests prone to motion sickness should take precautions. - Guests taking video in any format (tablet, video camera, cell phone) will be charged government fee of approximately $8-$10 USD payable in cash at site. 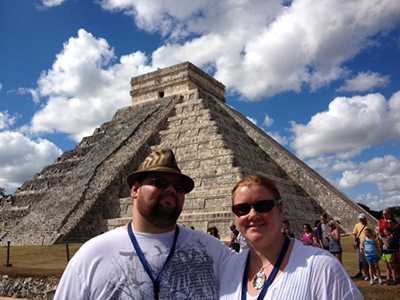 - For security and safety reasons, backpacks and large handbags are not permitted in to the Chichen Itza site. These items must stay on your bus, which will be secured by your driver. There are about twenty-one thousand temples, pyramids, and sacred centers in Mesoamerica. This elaborate network of sacred centers was used to keep balance on the Earth and to expand the consciousness of human beings. 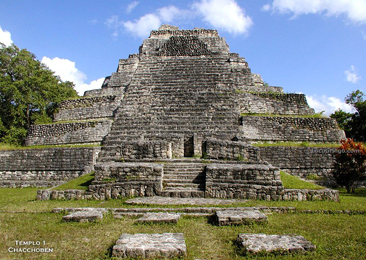 According to Maya Elder Hunbatz Men, there are more pyramids in Mesoamerica than anywhere else in the world. The culture of the pyramids was created here. 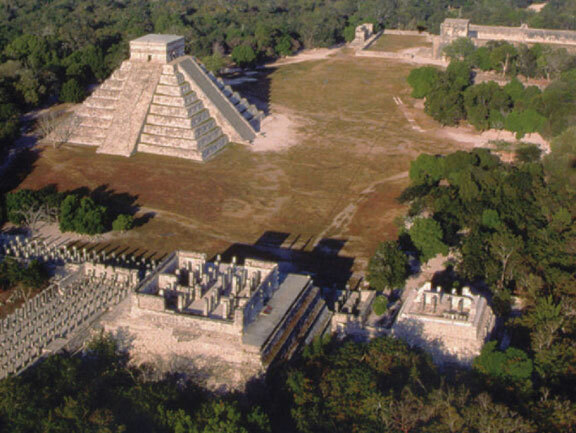 The main temple, he says, is the one at Chichen Itza. 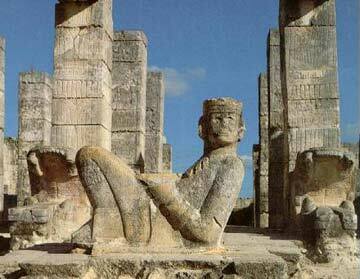 "The ceremonies that culminated at Chichen Itza were intended to help reprogram human DNA so that we humans can learn to exist on Earth in symbiosis with our light bodies-Sun bodies. Our DNA during the Mayan cycles of the Iast twenty-six thousand years has been encoded with a flaw that can, ultimately, become a source of deevolution. This flaw causes us to believe that we are separate from the Divine Source. For us to evolve identity, this flaw was required. But now it is time for us to move into communion with the Divine. "Our Mayan teachers knew that with the passage of time people would retum to this land to regain the knowledge of these stones. They are vibrating with the new era, to teach that which was written there. 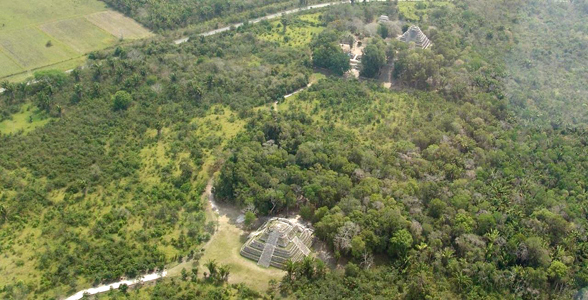 The prophecies say that thousands of people will come back there to try to rediscover the secrets and the philosophy of the Maya:' Hunbatz says that since the early I980s as many as thirty thousand to forty thousand people come each year as tourists. They began coming when the mainstream culture suddenly recognized that a dramatic insignia is formed on the side of one of the pyramids at special times of the year." The fee includes a meal and beverages. Transportation will be 12-person vans. Comfortable long sleeve shirts and long pants are suggested due to the strong Mexican sun and potential for insects in the jungle. Sensible, flat-soled, closed toe rubber-soled walking shoes, sunscreen (biodegradable preferred) and sunglasses are recommended. As you will be in the jungle, insect repellent is recommended. Ship arrival at Costa Maya: Meet at guide's office, which is a 15-minute walk from the main entrance of the Cruise Center. Minimum age to participate is 3 years old. Guests must be able to walk approximately one mile over packed surfaces during the 90 minute tour of the site. 7:05 AM: Meet in gathering place stated on shore excursion ticket, and walk together to office. 7:30 AM: Depart to Chacchoben ruins from office. 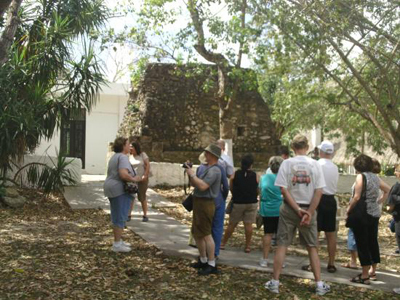 8:30 AM: Arrive at Chacchoben ruins and take walking tour. 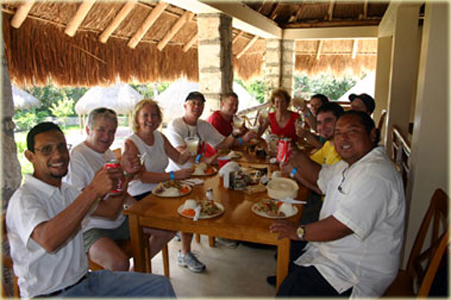 10:00 AM: Depart to Chacchoben Village to a Mayan family home and enjoy lunch. 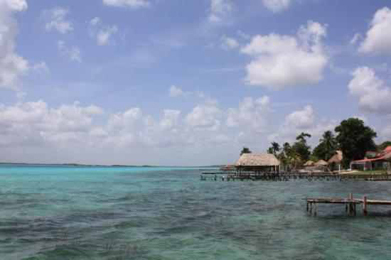 12:00 PM: Depart from Chacchoben Village to Costa Maya. 1:00 PM: Drop off at the Costa Maya Cruise Port gate. 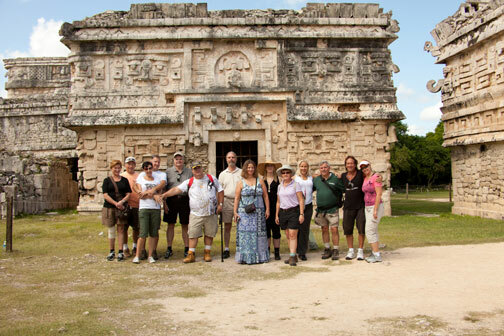 Experience the Mayan culture's past and present on this fascinating excursion. 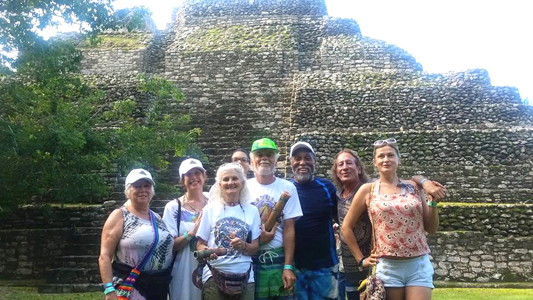 See the past during a tour at the famous Chacchoben ruins, and then experience the present during a visit and meal with locals in a Mayan house. Departing the pier, you will drive approximately 50 minutes to the site of Chacchoben, where the first human settlements have been dated as early as 1000 B.C. Evidence collected during the excavations shows that most of the structures restored were built around the years 300-360 A.D. and were modified up to five times over their history. 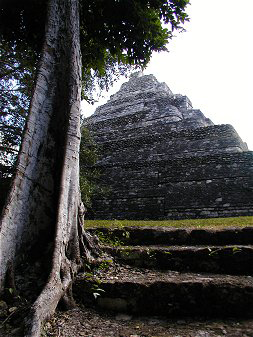 Today, Chacchoben still keeps most of its secrets covered with vegetation, offering visitors a unique opportunity to experience its magic and feel the energy of an ancient city in ruins. The ceremonial center of the site covers an area of nearly six square kilometers and is located in an area known as the "Region of the Lakes," due to the number of lagoons. Your expert guide will bring Chacchoben to life as he recants the history of the city and shares insights on its past and present during the approximately 90-minute walking tour of the site. 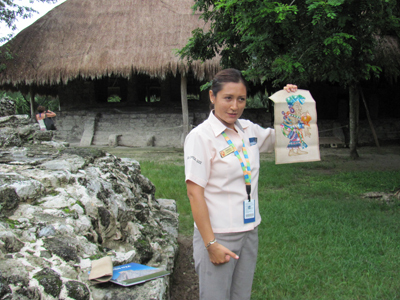 Your next stop will be Chacchoben Village, where you will meet a Mayan family in their home. Witness Mayan life and traditions as they unfold right before your eyes. 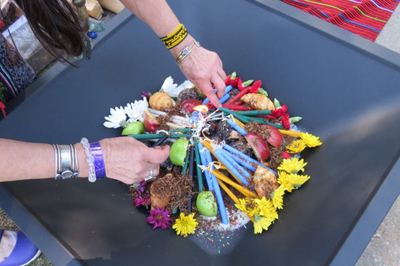 Learn about traditional home remedies, savor a traditional Mayan meal, make new friends and experience their colorful cultural expressions. Lunch will consist of traditional Mayan dishes, most of them from pre-Hispanic times. The recipes will be explained widely during your visit, and you will also have the opportunity to see the ingredients and spices added to your meal and learn how they were used. The Mayan diet is mainly vegetarian, and by tradition meat is not frequently included. However, during this special occasion, you may find chicken or turkey has been added in your honor. You will not soon forget this memorable experience! Please note: There is a fee to use a video camera at the archeological site (approximately $4 US). Credit cards are not accepted at the site for fees or shopping; U.S. dollars and local currency are. Ceremony led by Grandmother Elizabeth Araujo. Comfortable long sleeve shirts, long pants, and a hat are suggested due to the strong Mexican sun and potential for insects in the jungle. Wear sturdy, sensible, flat-soled, closed-toe walking shoes. No flip-flops or sandals. A bathing suit should be worn under your clothing. Bring sunscreen, insect repellent, sun glasses, change of clothing (optional), and a towel. Ship arrival at Costa Maya: Meet at guide's office, which is a 15-minute walk from the main entrance of the Cruise Center. Minimum age to participate is 3 years old. Guests must be able to walk approximately one mile over packed surfaces at the Chaccoben site. There is a fee to use a video camera at the archeological site. (approximately $4 US) Credit cards are not accepted for fees or shopping; U.S. dollars and local currency are. 7:15 AM: Meet in gathering place stated on shore excursion ticket, and walk together to office. 8:00 AM: Depart to Chacchoben ruins from office. 9:00 AM: Arrive at Chacchoben ruins for Maya Fire Ceremony. 11:00 AM: Depart from Chacchoben to Seven Color Lagoon. 3:00 PM: Drop off at the Costa Maya Cruise Port gate. 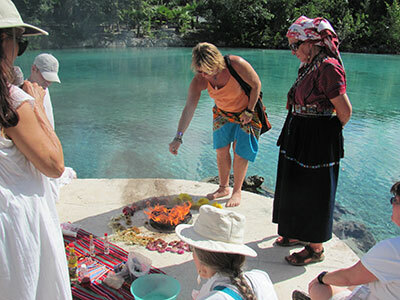 This tour will take us into the lush green of the jungle where we will witness an authentic Maya fire ceremony -- then on to an exciting adventure in the crystal-clear waters of the Seven Color Lagoon. Departing Costa Maya, we will drive approximately 50 minutes to reach our first stop, the ancient Maya ruins of Chacchoben in the jungle. The first human settlements in the area of Chacchoben have been dated as early as 1000 B.C. Evidence collected during excavations shows that most of the restored structures were built around the years 300-360 A.D. and were modified up to five times during their history. We will reach a section of Chacchoben that was recently opened to the public and currently not many people go there. 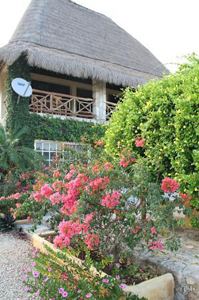 This will offer more privacy for our amazing authentic Maya Fire Ceremony with Grandmother Elizabeth Araujo. 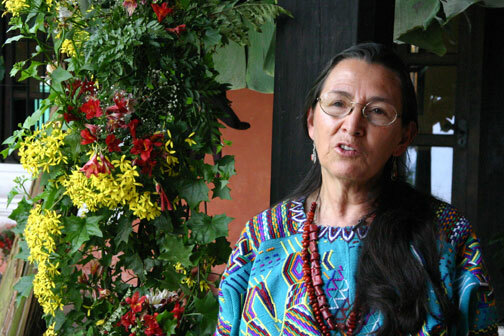 She is an honored and respected member of the Council of Maya Elders for the entire Maya World. 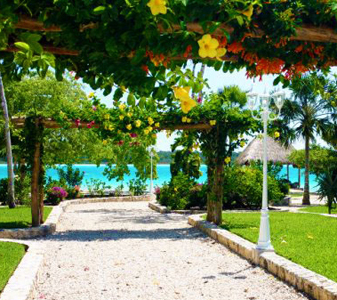 After the ceremony, we will travel through the jungle to the spectacular Seven Color Lagoon (Lake Bacalar), where we will enjoy a delicious, traditional, light Mexican lunch. The lake is approximately 50 miles long and is ideal for kayaking, canoeing, windsurfing, sailing and swimming! A variety of birds can be seen at Laguna Azul, including toucans. 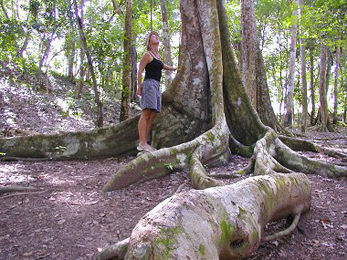 During our stop, a short jungle walk through the trails near Laguna Azul will be offered. 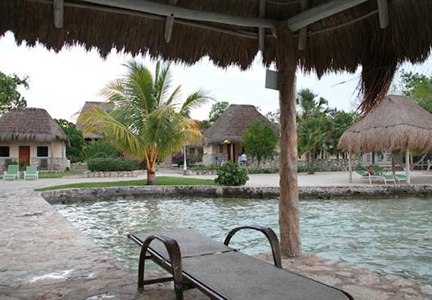 Guests can choose to do all activities, enjoy a dip in the crystal clear waters of the lagoon, or relax and enjoy the view from under the shade of a cabana. For many years, Chacchoben remained silent as evidence of the greatness of one of the most brilliant civilizations of the new world. 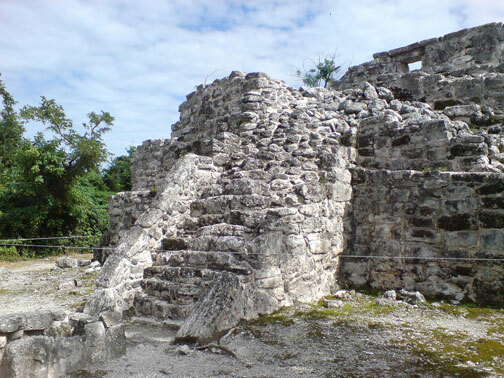 Today, Chacchoben has become the most visited ruins site in Costa Maya. 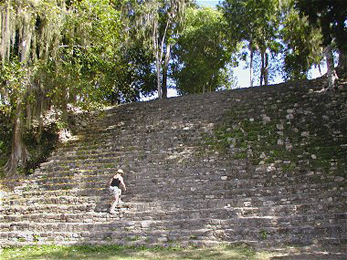 The seldom seen Mayan ruins of Chacchoben are a high, broad-leaf jungle ruin site. These majestic, mostly restored temple pyramids take on a mystical quality surrounded by towering mahogany trees, enormous cohune palms, strangler figs and the hanging tentacles of banyan trees. Chacchoben means "the Place of Red Corn," in Spanish "Lugar de Maiz Colorado." 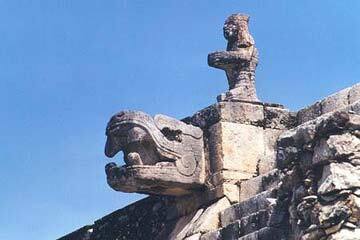 By 1847 the landscape had changed dramatically and there was unrest among the Maya population, that unrest ignited one last conflict, "the Casts War", when the Cruz'ob, went to war against the Mexican Federation for the control of the Yucatan Peninsula. During the 50 years of the Casts War, a number of atrocities were committed as entire towns were burned down to ashes forcing the Maya families to abandon their homes and flee from the conflict areas into the territory of Brittish Honduras (former Brittish Colony, today Belize) and into Guatemala. It is during these years of conflict that the rituals and visits to Chacchoben stopped until the site was forsaken by the Maya becoming one of the many Maya sites lost under the jungle. Today the site rests within a green island of trees covered with Spanish moss, palm trees and different varieties of orchids among other plants. This particular landscape gives Chacchoben a special touch that enhances the magnificence of the different structures, and invites you to relax and feel the harmony of nature and history. Edificio 24 in Plaza B is the first structure that you see but even more impressive temples lay behind in the Gran Basamento; the tallest one being Temple 1. Some low structures are in Plaza Las Vias canopied by a forest of Cohune palms and mahogany trees. The archaeologists think Chacchoben was settled about 200 BC but the buildings excavated thus far date from around 700 AD. Chacchoben has a wonderful primal feel surrounded by tall palms and trees, many with long beards of Spanish moss waving in the gentle breeze. Elizabeth Araujo was raised in El Salvador. 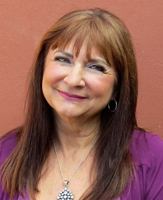 She is a warm, compassionate person manifesting a discernment that crosses cultural boundaries. 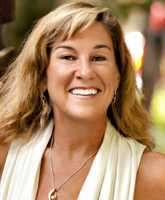 She travels extensively throughout the world. Wherever Tata and Elizabeth are called to do ceremony and hold council with Elders, they bring unification, balance and harmony to Mother Earth. Her gentle spirit and clear intent create an atmosphere of acceptance, love and allowance. 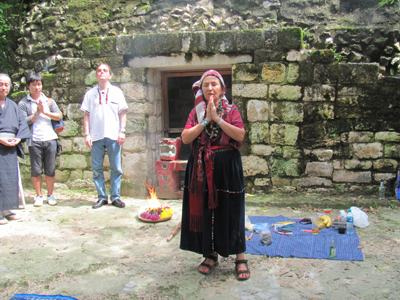 Elizabeth works through the Maya traditional healing ceremonies with the Sacred Fire and serves as a guide for spiritual journeys to sacred sites. Recently, Elizabeth answered some questions that have been on all of our minds. We thought we'd post it here for all to enjoy! "Must we prepare for the change or continue living as we are accustomed to?" "Why won't everyone go into this ascension?" "How do we prepare to go into this ascension of the planet?" 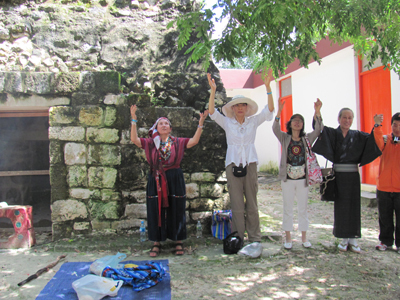 Elizabeth will guide us in a powerful ceremony on land at Puerto Costa Maya, at the sacred ruins of the ceremonial center at Chacchoben. 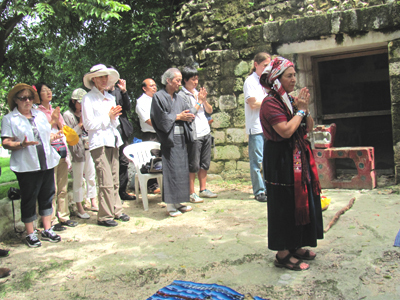 The Maya Ceremony is an offering given to our Creator. In this occasion it will be to give thanks for being together and to ask for peace and unity in the world. 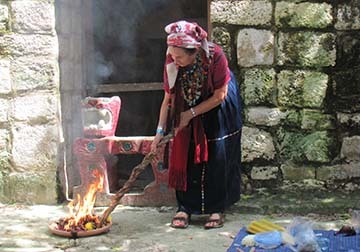 The Fire Ceremony is the spirit of the Maya Tradition. The fire transforms, the fire purifies. Through the fire we connect with our Creator. We drow a glyph on the ground and I will explain the meaning of it before placing our offerings in it. I will explain the meaning of the day in the Maya Caledar. We invite the spirit of the water, mountains, the spirit of our ancestors, etc, to accompany us, we present ourselves to the sacred fire who will take our petitions and prayers to our Creator. 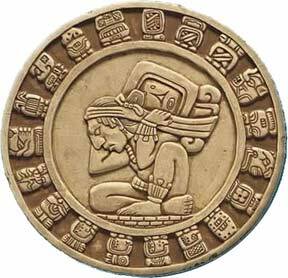 We greet the 4 directions and then we proceed to call the 20 days of the Maya Calendar explaining their meaning. After calling the days and before closing the Ceremony there is time for anyone to speak if so desires. We give thanks to the spirits that accompanied us, we give thanks to Our Creator and Mother Earth and Close the ceremony, at this time the fire is all consumed. 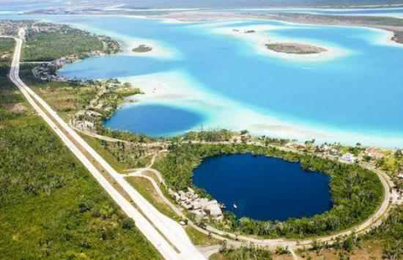 After our trip to Chacchoben, we will travel to spectacular Seven Color Lagoon (Lake Bacalar) where we will visit a charming, picturesque, emaculate resort. The lake is approximately 50 miles long and is ideal for kayaking, canoeing, windsurfing, sailing and swimming! 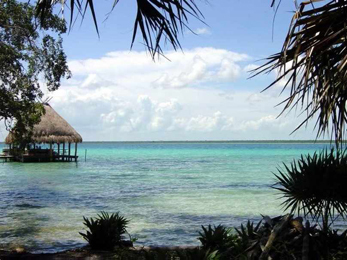 Visit the lagoon of the Seven Colors/Lagoon of Bacalar. This is the second largest Mexican natural freshwater lake. Its pristine crystal clear tropical fresh water ranges in colors from various shades of green, to intense turquoise, and various hues of blue. From the air, Balacar Lagoon looks like a beautiful turquoise ribbon in the middle of the jungle. A variety of birds can be seen at Laguna Azul, including toucans. During your stop, a short jungle walk through the trails near Laguna Azul will also be offered. 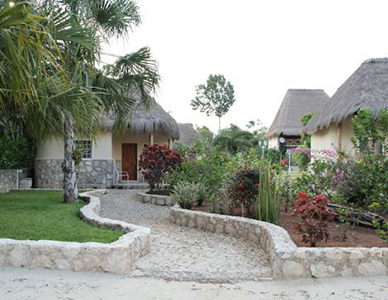 Guests can choose to do all activities or just relax and enjoy the view from under the shade of a cabana. A light lunch is served. 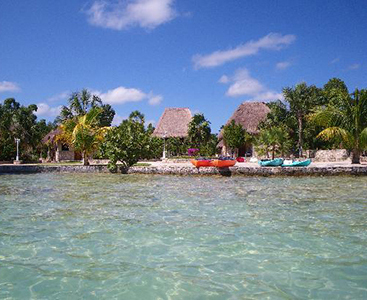 Bacalar Lagoon is a hidden jewel that is still not well-known by international tourism. 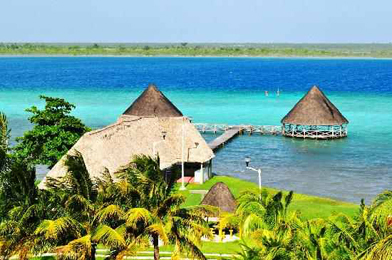 Its breathtaking scenery makes it a world class freshwater lake with a colorful Mexican community for those who love Mayan history and cultural heritage. 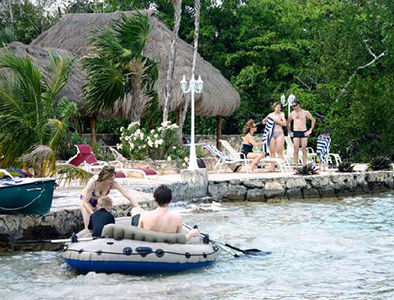 This area is becoming one of the most important destinations for the tourism of adventure in a historical and cultural scenario along Costa Maya. This fresh water lagoon, the second largest in Mexico, reflects all the shades of turquoise and blue as it flows toward the Caribbean Sea. Touch paradise in the world´s most beautiful freshwater lagoon lost in the reflection of the sky leaving you in a magical world where the senses wake up to see, listen, smell, feel and taste, conquering your soul. 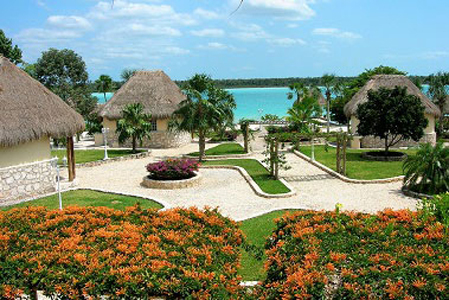 Bacalar Lagoon Resort offers you the experience to live in harmony with the tranquility and beauty of a tropical paradise. 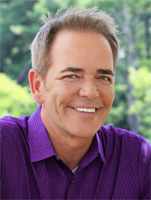 90-minute workshop with LIVE mediumship readings: $89. 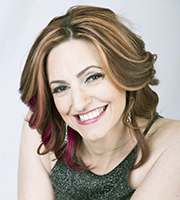 3-hour workshop with Meet and Greet at the end: $149. 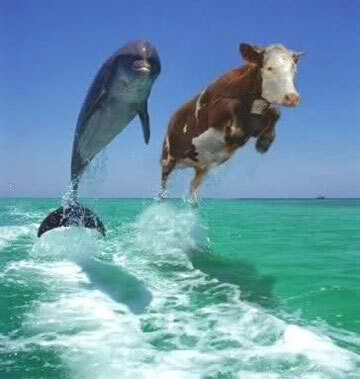 HOLY COW ! 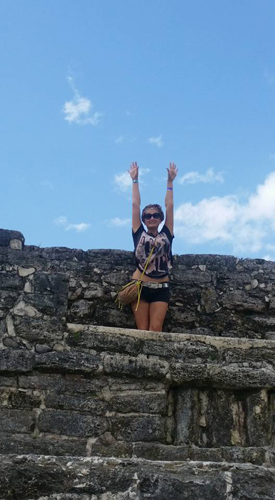 Take the leap and Register NOW for your shore excursions and special events!